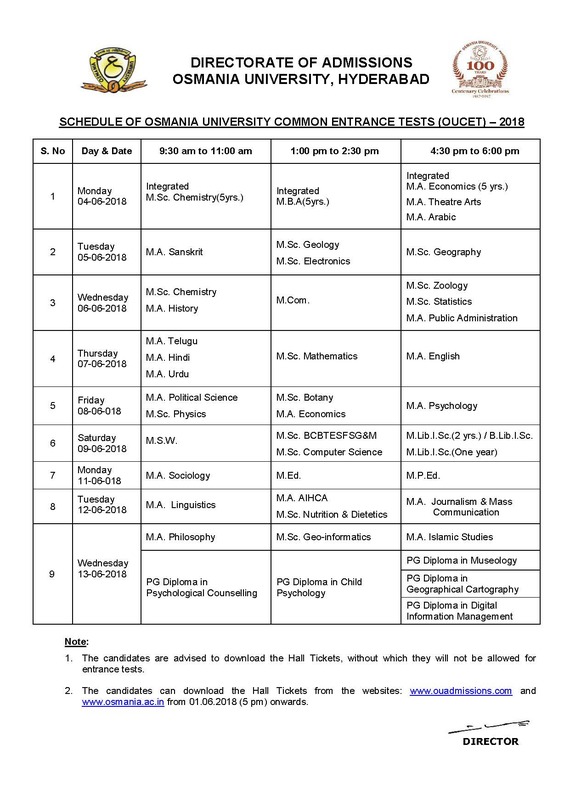 OUCET Hall Ticket 2018 : Osmania University Common Entrance Test (OUCET) hall ticket is now available to applicants on OU Official website oucet.ouadmissions.com. The OUCET Exam is scheduled from 4th June to 13th June. Hence applicants can hurry up to download the hall tickets as it is the most requisite document to attend the examination. All the candidates those have applied for the OUCET examination are advised to download the hall ticket from today (01-06-2018). After downloading the hall ticket applicants have to glue the recent color passport size photograph at the provided column. Candidates must also attest their photo after affixing it. The OUCET examination is scheduled to be held at Osmania University, Mahatma Gandhi University, Palamuru University, and Telangana University and etc which will be mentioned on your hall tickets. Candidates can check the details of their examination venue, date, timings from their hall tickets. Also, candidate’s name, date of birth, father’s name and other details will be printed on the hall ticket. After downloading the hall ticket candidates can go through all the information clearly. All the Candidates attempting the OUCET examination must download the hall tickets. Hall ticket is the most important document that has to be projected at the examination hall. Candidates must show theirs admit cards at the time of verification. Otherwise, they will lose the opportunity to attempt the examination. The Osmania University Common Entrance Test will be led by Osmania University every year. It is the admission test conducted for aspirants seeking admission into various post graduate courses such as M.Sc, MA, with specializations and also conducted for aspirants seeking admission into 5 years integrated PG Diploma courses. The examination has been scheduled for 3 different slots morning, afternoon, and evening shifts and will be conducted from 4th June to 13th June. A large number of hopefuls seeking admissions in OU PG Courses have applied for the OUCET 2018. 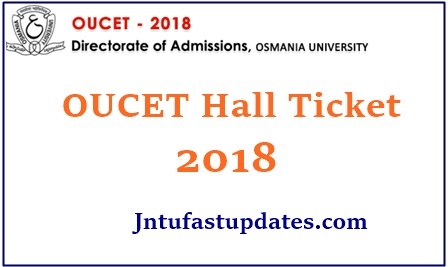 All the candidates who are going to attend the OUCET examination 2018 can download the hall tickets from 1st June 5 pm onwards. The OUCET 2018 Hall ticket is now available to download at Ouadmissions.com. Hence candidates can hurry up to download the hall ticket. Also, candidates have to strictly follow the instructions that are printed on hall tickets. Note: 1. Test Zones covers the area as Hyderabad (Alwal, Moula Ali, Mallapur) and Rangareddy (Hayatnagar, LB Nagar, Karmanghat). 2. Hyderabad II (Kukatpally, Patancheru) Zone added Newly. Candidate login information such as username and password. The OUCET 2018 Admit Card will be downloaded. while remaining 25 marks will be awarded by the Department of Physical Education, Osmania University for the Sports Achievements of the candidates. The entrance test paper for admission into M.Sc. Biotechnology, Forensic Sciences, Biochemistry, Genetics, Environmental Science, and Microbiology will be divided into two parts. Part B will be one of the optional subject studies at B.Sc. Level (Physics, Zoology, Genetics, Botany, Biochemistry, Microbiology, and Biotechnology) and will be of 60 marks.